Welcome to the end of the week and this week's edition of Five Things for Friday! The featured flower this week is the Dutch Iris. Funny thing about this flower, I don't actually remember ever planting it. These plants grow from a bulb and I must have at one point planted some, or one, as now I've got about 20 in my garden! They come in a variety of colors and patterns, mine are white. Unlike other varieties of irises, the foliage on Dutch irises resemble a grass. Uncut, they flower for several weeks in the yard, or if you prefer, they make great cut flowers! Last Sunday was Mother's Day and we spent a great day with family enjoying the company, food, and nice weather. The women in the family made a quick trip to the Grand Marketplace in Portland. It's a fun place to browse for antiques, oddities, and vintage and industrial ware. I picked up, of all things, a pair of harem pants and aside from the fact that they look completely bazaar, I love them! This is my first pair and I'll (probably) never wear them out in public but, seriously, THEY ARE SO COMFORTABLE! In fact, I think they may replace sweat pants for that after-work-still-daylight-and-too-early-for pajamas clothing! On our way back from the Marketplace, I found this little cabinet FREE on the sidewalk. It's a little primitive but that's what I was drawn to. I've got plans for it! I definitely see it on wheels, maybe in a kitchen for extra storage? I forgot to mention this last week so I'll add it to this week's Five Things. Last Thursday we were about a block away from Alberta street in Portland and there seemed to be a small crowd gathering in the street and no cars were moving in either direction. As we continued to walk on, we quickly saw why. 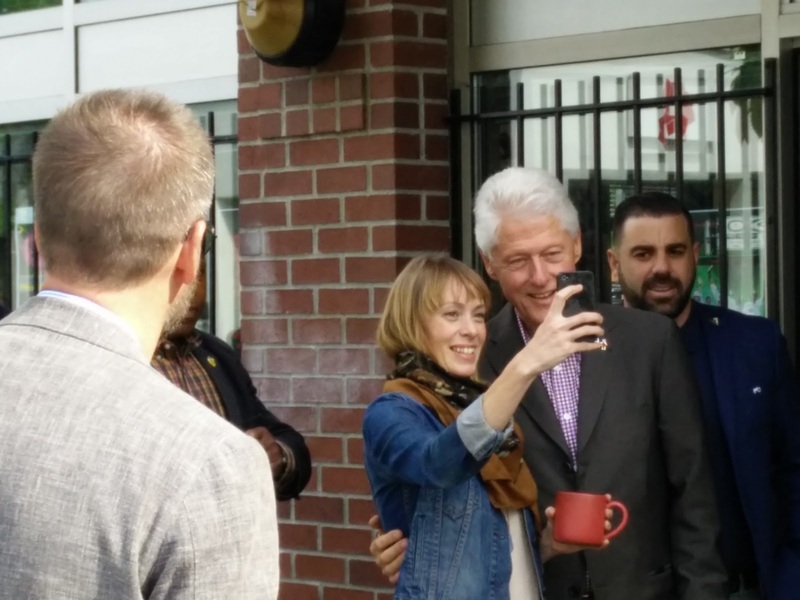 President Bill Clinton was walking the street doing a meet and greet and stumping for Hillary. As we got to Alberta, we walked right up to him, shook his hand and talked for a moment. I didn't have my phone with me to snap a selfie with him (is it technically a selfie if someone else is in the photo?) as I was going to yoga. Jeff was too busy talking to him to take a photo however he did circle back and took this photo later. He was quite approachable and many people got pictures. That was my first and only brush with celebrity if you don't count seeing Carrie Brownstein at Fred Meyer and Fred Armisen shopping on Mississippi Street and in both cases I didn't approach them. We are huge fans of hot sauce around here! We've even made our own at times. Here's a nice write-up listing some of the stand out sauces from this year's NYC Hot Sauce Expo (Seriously, there is such a thing!) The artwork on some of those labels is amazing! I see this one getting heavy rotation around here soon! That's it for this week! Enjoy your weekend! After a complete week of nice weather, it's supposed to rain this weekend. That will give me a good excuse to start working on my new sidewalk find!